​The coordinate plane is a two-dimension surface formed by two number lines. One number line is horizontal and is called the x-axis. The other number line is vertical number line and is called the y-axis. The two axes meet at a point called the origin. We can use the coordinate plane to graph points, lines, and more. 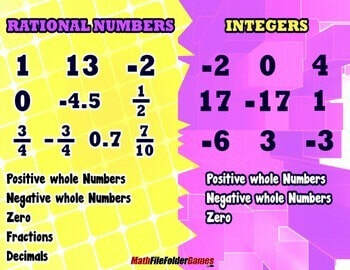 Integers are positive and negative WHOLE NUMBERS including zero. a rational number is any number that can be expressed as the quotient or fraction p/q of two integers, a numerator p and a non-zero denominator q. Since q may be equal to 1, every integer is a rational number. ... A real number that is not rational is called irrational. The distance a number is from zero. Examples: I -5 I= 5 because -5 is 5 units away from Zero. I 4 I = 4 because 4 is 4 units from zero.